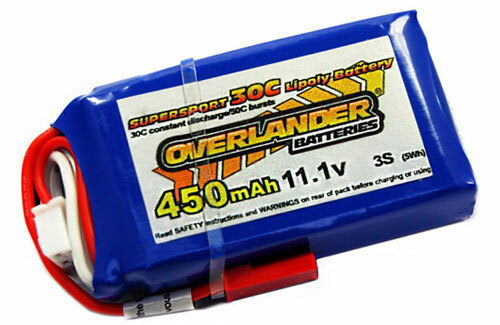 All Products > "2557 Overlander Li-Po Batt 450mAh 3S 11.1v 30C"
Lipo Batteries 450mAh 3s 11.1v 30C Supersport. Fully compliant LiPo batteries, choice of champions and record breakers! The best just got better. 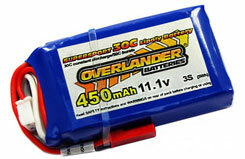 Overlander NEW Sport 450mAh 3s 11.1v 30C is part of our Supersport range. All Overlander Supersport 30C LiPo cells are manufactured using the "STACKING" method, unlike many of the cheaper Chinese imports which are manufactured using the "WINDING" construction, a much cheaper construction method, with very limited discharge rates (15C - 18C) but often quoted as 25 - 30C. Stacking construction is known for its longevity, and gives stronger more reliable voltage.